The Oakley Mainlink prescription sunglasses integrate a classic look with the versatility of active lifestyles. Most sport frames look like sport frames and typically have a high wraparound curve, edgy lens design, and crazy colors. The Mainlink strays away from that common theme with a casual look and sport funtctionality. A key feature that make this frame equipped for action is Unobtanium on the underside of the temples and nosepad. Unobtanium works by getting stickier and tackier the more you sweat so the frames stay in place. The lightweight O-Matter frame material and Three-Point fit system make for a comfortable fit all-day long. Plutonite lenses are highly impact resistant and will filter out 100% UVA, UVB, and UVC light and Blue light up to 400nm. 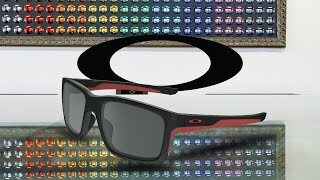 If you are looking to maximize your versatility the Oakley Mainlink is for you!